The recent announcement that Canada will install twenty-four custom search-and-rescue signal repeaters on-board US Air Force next generation global positioning satellites, as part of the quarter billion dollar Canadian Medium Earth Orbit Search and Rescue (MEOSAR) satellite project, highlights the growing need for satellites to maintain full time contact with ground stations where the data can be collected and acted upon. 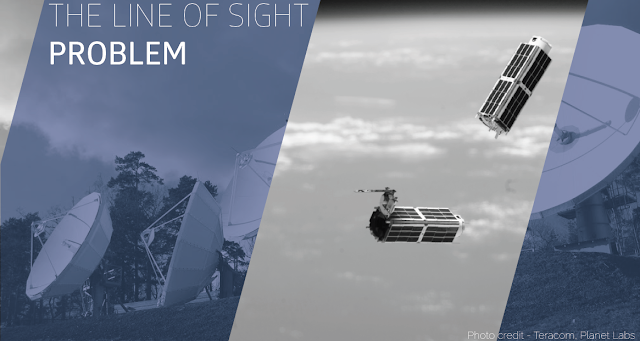 Retrieving data from a satellite requires a line-of-sight between the ground station and satellites, and for non-geosynchronous satellites this means being able to relay data to any specific ground station for a short period during each orbit. This makes it difficult for satellite operators to manage tasks requiring real-time communications, such as live aircraft tracking, disaster management, or spacecraft command and control. The typical solution to the problem is to build multiple ground stations which can be used during different points in the orbit. But satellite constellations, such as the 24 satellites being used for the US Air Force next generation global positioning satellites, can also be built with "repeaters," which amplify and re-transmit signals to other satellites within the constellation and then to line-of-sight ground stations. Not only can repeaters cost less than additional ground stations, but geopolitical constraints often limit where they can be placed. Graphic c/o Terracom/ Planet Labs. Kepler Communications, a small Toronto, ON based start-up sees the potential for commoditizing inter-satellite communications, and is building commercial “off the shelf” re-transmitters (or "repeaters") able to work on a wide variety of satellites. As outlined by Kepler co-founder Jeffrey Osborne, "a fundamental transformation is happening today in the space industry" and his company aims to take advantage of it. According to Osborne, an industry once dominated by custom spacecraft built only by national civilian and military agencies is rapidly being superseded by smaller, lower-cost platforms built by private companies utilizing a standardized micro-satellite or satellite bus. If history is any guide, these standardized satellites will eventually also standardize their other components, including their communications capabilities. Osborne thinks that the best way to capitalize on this trend is to design and build a standardized repeater which can be installed and used by any satellite, in much the same way that people making phone calls use the same terrestrial network in order to complete their calls. To this end, Kepler is developing inter-satellite networking options including an S band repeater for low data-rate local area networks, and electrically steerable X band antennas for higher data-rate and long-distance inter-satellite communications, with particular focus on usage within the emerging small satellite market. 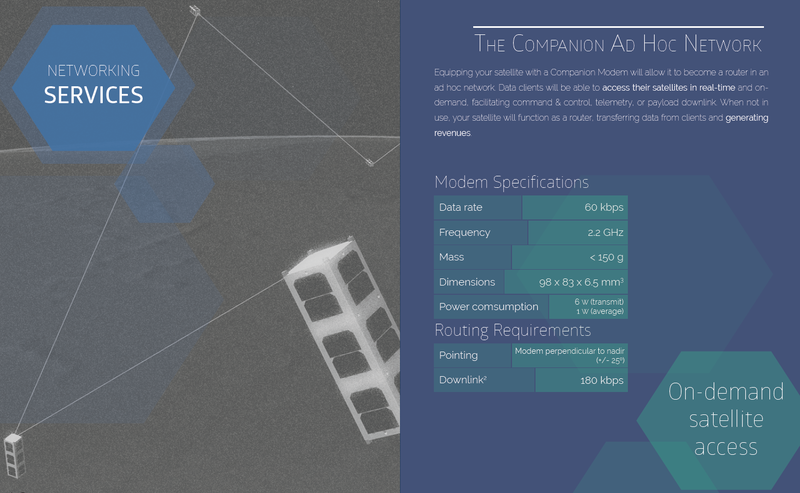 Specs for what Kepler calls the "companion ad-hoc" network, a standardized satellite modem which will create an S band network allowing satellites to communicate with each other. According to Osborne, Kepler’s initial funding was provided by the University of Toronto Institute of Aerospace Studies (UTIAS) Start Entrepreneurship Program. 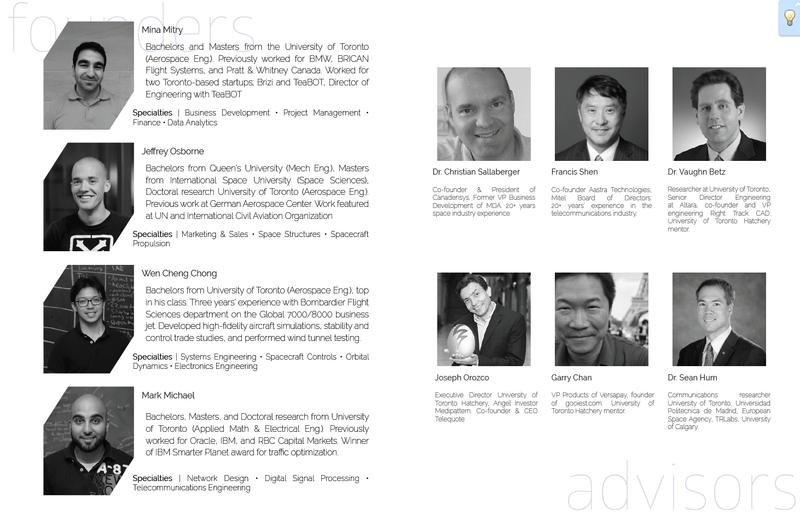 The program is sponsored by Francis Shen, the founder of Aastra Technologies. Graphic c/o Kepler Communications. The real benefit of inter-satellite communications comes when it is possible to send large quantities of data over very large distances, and to this end he company is also developing a "highly directional electrically steerable antenna," in addition to the base repeater. The unit would increase data transfer speeds by up to 35% without the need for mechanical actuation or spacecraft slew operations required by other directional antennas, and would allow high-speed inter-satellite links in a small satellite package. The component will add less than 150 grams to the total weight of the repeater. The company has also developed plans for a constellation of 50 dedicated satellites located in five separate polar orbits, in order to provide a ready built satellite network of data relays which will support the communications network. As outlined in the Kepler literature, the company founders and supporters include a range of well known space and IT focused entrepreneurs and academics. Graphic c/o Kepler Communications. Of course, an expensive 50-satellite constellation is still a thing for the future. For now, the focus of the Kepler offering will be technologies and services for inter-satellite communications. As long as Osborne and his colleagues are able to provide a lower cost than the Canadian government was able to provide for the MEOSAR search-and-rescue signal repeaters, then Kepler's future might end up looking very bright indeed. Chuck Black is the editor of the Commercial Space blog. 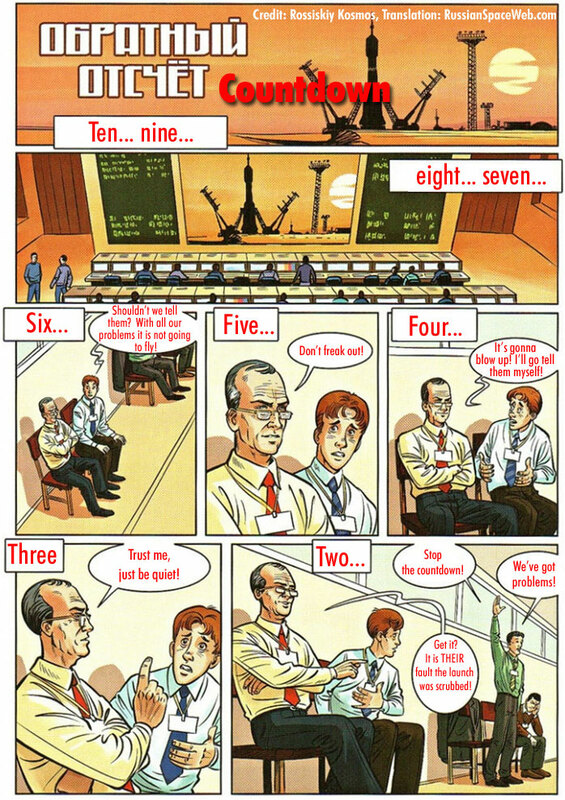 When is a space announcement not worth a plugged kopek? When it’s about Russia’s space plans. According to Russian journalist Anatoly Zak, writing on the Russian Space Web industry page, it is sometimes "more dangerous for Russian space officials to declare the spacecraft not fit for launch than to let it fail in space. Admitting problems before launch could be a career suicide, while problems in orbit, if they do happen, could be always blamed on external factors, such as meteoroids, space junk, American secret weapons, or on scapegoats at the bottom of the industrial food chain, such as computer programmers, welders or propellant-loading technicians." Although this tendency is not unique to the Russian space program, other problems, including a costly effort to replace Ukrainian and Western components lost to sanctions imposed during the Ukraine crisis, multiple industry restructurings and even an economic turf war waged between the Russian Federal Space Agency (Roscosmos) and the United Rocket and Space Corporation (ORKK), which included grandiose and contradictory proposals from both organizations, have sapped the strength of the Russian space industry. Graphic c/o Rossiskiskiy Kosmos. Translation c/o Russian Space Web. The December 18th, 2014 blog post “Roscosmos is Assessing its Future Programs,” outlined some of Russia’s ambitious space plans: a low-orbit space station, a high-orbit space station, a super heavy-lift Moon rocket, nuclear space tugs and a Moon base. Ah yes, the Moon base, Russia’s pet fixation. Back in 2012 Russia wanted to team up with the United States and Europe to build a research colony on the Moon. Earlier this year the Russians wanted to buddy up with the Chinese on the Moon base idea. It seems that the only country Russia hasn’t yet considered as a Moon base partner is the Duchy of Grand Fenwick. Russia released its newest space plan for 2016-2025 last April 23rd. As reported in the May 2nd, 2015 SpaceFlight Insider post “Russia’s new space program: Search for extraterrestrial life amid budget cuts,” the Russian space agency, Roscosmos, wants to search for extraterrestrial life and send satellites to the Moon and Mars. Those Moon landing plans are still in there, too. Roscosmos has one small problem—their budget has been cut by 35%, which will affect some of those projects including that Moon rocket. All of the grand plans announced over the past few years are more fantasy than fact. A song from the 1972 movie musical “Cabaret” sums up why. The song is called “Money” and it's about how that specific commodity helps to make the world go around. Money also makes space programs go ‘round. That’s why you can disregard these announcements. Russia doesn’t have the money. What’s causing Russia’s monetary grief? For one thing, sticky fingers. Some comrades have taken the words of the song to heart...just not in a state-approved way. A Moscow Times story from July 27, 2015 “$126 Million Stolen From Russian Vostochny Cosmodrome Project - Prosecutor General,” says contractors at the site of the new spaceport in Russia’s Far East have skimmed 7.5Bln rubles ($150Mln CDN) despite warnings from Russian President Vladimir Putin that they were being watched. You just can't make this sort of stuff up. This screenshot from a local police video shows an unnamed 45-year-old Georgian national being arrested in Belarus in June 2015, while driving a "diamond encrusted" Mercedes. The suspect is a accused of embezzling funds for the construction of the Vostochny Cosmodrome from the Russian government. Photo c/o social media. Even without the embezzling, the Vostochny facility has problems. The August 24, 2015 Sputnik International article “First Manned Launch From Russia's Vostochny Cosmodrome Delayed Until 2025” quoted a Roscosmos official as saying the first crewed launch at the Cosmodrome has been pushed back from 2018 to 2025. They’ve decided to wait for the new Angara rocket rather than using the site for the older Soyuz. It’s the same Angara rocket that’s been under development since the early 1990s and has been delayed because of...you guessed it—money, money, money. But it took more than creative skimming to put Russia in this mess. The key to the Russian ability to compete in space, or anywhere else for that matter, is the strength of the Russian economy. As outlined in this December 22nd, 2014 CNN report "Russia's economy is on the brink of collapse," the economy was damaged by a series of political and economic hits beginning in early 2014 which culminated in the June 2014 collapse of international oil prices. According to the report, Russian citizens have responded to the crisis by rushing to buy "foreign imported goods," which would be more likely to maintain value as the local currency inflated. 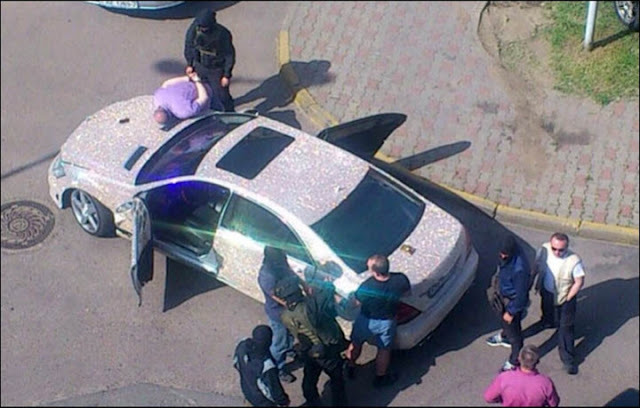 No doubt, this would explain all those locally owned but foreign built and diamond encrusted luxury vehicles. Video c/o CNN. According to the July 23, 2015 Telegraph article, “Oil and Gas Crunch Pushes Russia Closer to Fiscal Crisis,” the big problem is the resource-based Russian economy. Revenues from oil and gas are dropping due to reduced demand from Europe. Foreign partners have pulled back from development projects because of the political sanctions over Russia’s incursion into Ukraine. Russia made a big bet on the oil and gas industry. They let their manufacturing base erode and failed to develop a high tech industry. They have nothing to pick up the slack due to falling oil prices. 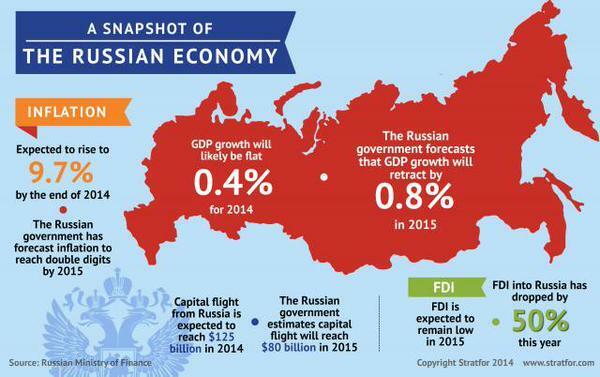 A snapshot of the Russian economy covering 2014 with estimates for 2015, which was compiled using data from the Russian Ministry of Finance. What will 2016 be like? Graphic c/o Stratfor. Some analysts say there is some good news. The July 28th, 2015 Moscow Times article “Is the Worst of Russia's Economic Crisis Over?” has indicated that the economic decline may have bottomed out. Don’t break out the vodka just yet, though. The prognosis is “cloudy” because the measures taken—the government devalued the ruble and increased spending to prop up the economy—were used twice before during recessions. The benefits in each case were short-lived. The story goes on to say that this strategy has prevented the Russian economy from diversifying, which maintains the status quo and leads to a new financial crisis. Russia’s economic problems are starving their exploration and commercial space programs of the money they need, putting Russia further behind other space nations. Money makes the world, and space programs, go ‘round. It could be that the only spinning the Russian space program will be doing is spinning its wheels. 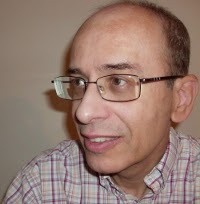 Glen Strom is a freelance writer and editor with a background in business and technical writing. He's also the editor of The Gazette Weekly, the newsletter of the Canadian Space Society. !960 newspapers article on BlueStreak. The general confusion during the late 1950s about the merits of missile defence led to several questionable strategic decisions made by the Governments of Canada and the United Kingdom. 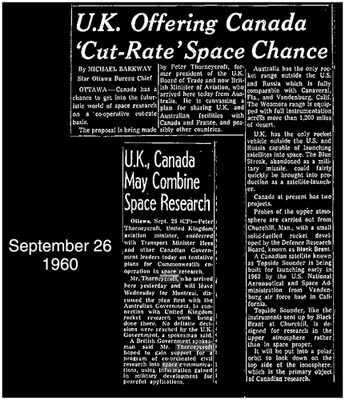 The possibility of a third contestant in the Space Race, in the form of a Commonwealth space program hinged on the sharing of technology and financing amongst the various invested nations, but more significantly on the political choices made regarding the future defensive postures of Canada, the United States and the United Kingdom. On September 26th 1960 The British Aviation Minister, Peter Thorneycroft, arrived in Ottawa to solicit Canada's support. The Diefenbaker government reversed their position of a year earlier and made it known that they were not interested in participating in a Commonwealth space program. With the Bomarc issue still hanging in the air Canada's government expressed little interest in telling the Canadian public that they might be considering financing yet another missile program, regardless of what it was for; especially since they had already committed to Black Brant. This was clearly the moment when the plans for a Commonwealth space program died. The dream had lasted barely two years. In some respects this was one of the critical moments when Britain ceased to be the mother of Empire and reluctantly became part of Europe. The choices remaining to Westminster were to concede space to the USA and the Soviet Union, or make a deal with Germany and France. In early 1961 discussions continued briefly between Canada, Britain, Belgium, Denmark, Germany, Italy, Holland, Norway and Switzerland for a joint Commonwealth/Europe space launcher. Delegates from these countries were taken to see the Blue Streak facilities but the Canadian government, when it was paying any attention to space at all, would continue to look at the bigger opportunity offered by its southern neighbor. Rather than commit to a Commonwealth/ European space program Canada's government chose to sit on the sidelines with observer status. A formal agreement was undertaken by the UK, France and the United States to investigate the benefits of trans-Atlantic satellite communications. Canada was to be kept "fully informed" of their progress. The already scheduled Canadian Alouette satellite would, once launched, perhaps provide some insights into the problems associated with long-range satellite communications. 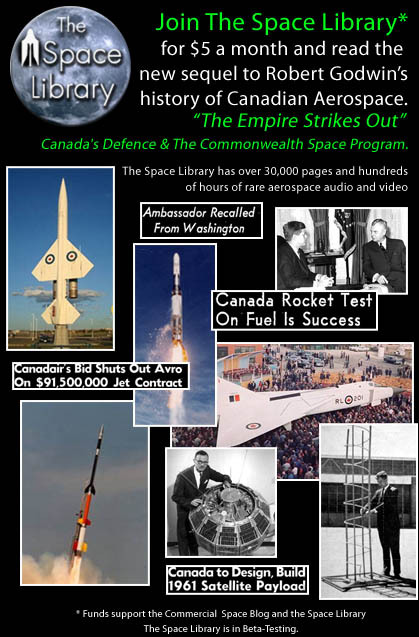 "The Empire Strikes Out - Canada's Defence & The Commonwealth Space Program"
Join The Space Library Today! Robert Godwin is the owner and founder of Apogee Space Books. He is also the Space Curator at the Canadian Air & Space Museum. 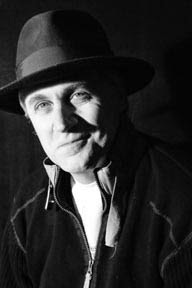 He has written or edited over 100 books including the award winning series "The NASA Mission Reports" and appeared on dozens of radio and television programs in Canada, the USA and England as an expert not only on space exploration but also on music. His books have been discussed on CNN, the CBC, the BBC and CBS 60 Minutes. He produced the first ever virtual reality panoramas of the Apollo lunar surface photography and the first multi-camera angle movie of the Apollo 11 moonwalk. His latest book was written with the late Frederick I Ordway III and is called "2001 The Heritage and Legacy of the Space Odyssey" about the history of spaceflight at the movies. Last Week: "BOMARC; the Blue Streak; the Blue Steel or the Douglas Skybolt and Woomera," in part six of "The Empire Strikes Out - Canada's Defence & The Commonwealth Space Program." Next Week: "The Diefenbaker Government Collapses," as part eight of "The Empire Strikes Out - Canada's Defence & The Commonwealth Space Program" continues! Cover for the September 7th, 2015 issue of MacLeans. For those who are currently too busy keeping up with the Kardashians to pay attention to our home grown domestic talent, Canada's favorite retired ex-astronaut has a lot of events on the go. These include guest editing the venerable MacLeans (Canada's "weekly current affairs magazine"), putting the final touches on a debut album (recorded during his 2012 - 2013 stint on board the International Space Station) and even preparing for the release of a new online video series titled "It's not Rocket Science." 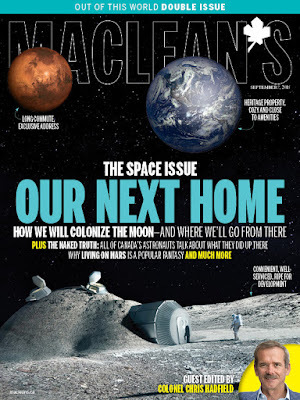 As outlined in the August 19th, 2015 MacLeans online article, "Introducing the Maclean’s Space issue—edited by Chris Hadfield," Hadfield is "certainly no stranger to the magazine, having graciously agreed to have his face painted with a David Bowie-style lightning bolt for our cover two years ago." He played a key role in determining the stories and selecting the images you’ll see. He read every word of the package, correcting some facts and popular misconceptions, and even catching a spelling mistake or two. He also wrote an erudite editorial putting the exploration of space into the context of human history. And his passion for a Moon base as humanity’s next logical step into space, as well as his opinion that manned flight to Mars remains unrealistic in the foreseeable future, led us to rethink how we treated these two topics. But Hadfield hasn't been just burnishing his editorial skills over the summer. He's also been putting the finishing touches on his upcoming, debut album. As outlined in the August 7th, 2015 Canadian Press article, "About to launch album debut, Chris Hadfield talks recording music in space," the album, titled “Space Sessions: Songs from a Tin Can,” will be released on October 9th and carries the weighty honour of being the first album recorded at least partially off planet. According to Hadfield, the eleven song collection, which includes his famous David Bowie cover tune, “Space Oddity,” is not intended to rocket him to musical stardom. Instead, it’s another step in the retired astronaut’s multimedia mission "to translate the joy of space travel to the earthbound public." Graphic for the new Chris Hadfield online video series. Graphic c/o Evan Hadfield at INRS. ... a monthly animated series meant to help make things better by simplifying scientific concepts into an easily digested narrative. You're going to absolutely love it. No doubt we will. We've certainly loved everything up until now. Here's hoping that the intrepid Commander Chris doesn't manage to "jump the shark," or "nuke the fridge" anytime soon. 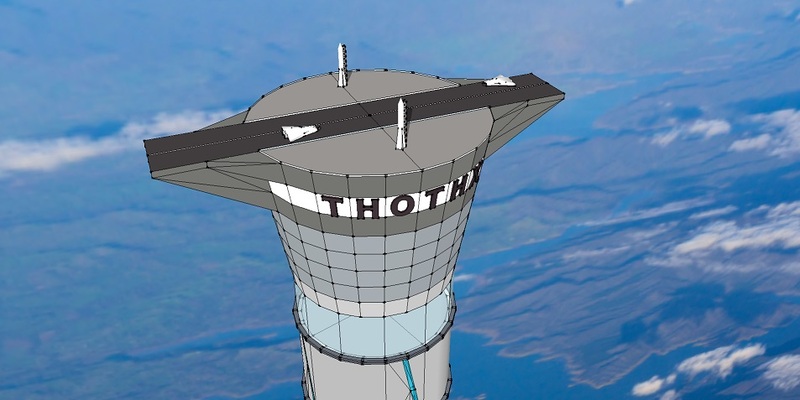 Pembroke, Ontario based Thoth Technology's recent announcement that the company had been granted a "United States patent for a space elevator," likely won't cause any stock analysts to downgrade their recommendations for the large, publicly traded rocket firms which currently put objects into orbit. After all, Thoth has been making the very same announcement for at least the last five years and nothing has ever come of it. An info-graphic covering many of the concepts surrounding a space elevator including the best potential locations (at the equator), optimum distance from Earth for the various components, a sampling of the various materials which can be used to create the elevator, a selection of construction options (including generating a space elevator from geosynchronous orbit) and a comparison between the size of a space elevator, the size of the tallest terrestrial mountain (Mt Everest) and the deepest ocean trench (the Marianas Trench). It's worth noting that the info-graphic, originally published as part of the August 2000, NASA/CP—2000–210429 document "Space Elevators; An Advanced Earth Space Document for the New Millenium," explicitly references the possibility that high altitude balloon structures could "provide support and stability through the upper atmosphere," in much the same way as the 2015 Thoth patent application. For more background on the concepts behind space elevators, check out the .August 23rd, 2013 Stories by Williams article on Space Elevators. Graphic c/o NASA. The core of the latest story surrounding Thoth is the July 21st, 2015 Thoth press release, "Canadian Company granted US patent for space elevator" and its claim that Thoth had been "been granted the United States patent for a space elevator." According to the press release, "the freestanding space tower is pneumatically pressurized and actively-guided over its base. Reaching 20 km above the planet, it would stand more than 20 times the height of current tall structures and be used for wind-energy generation, communications and tourism." And the patent, US Patent 9085897 for a “Space Elevator,” a "freestanding space elevator tower for launching payloads, tourism, observation, scientific research and communications," is certainly reasonable enough, if a bit short on details. Graphic from Thoth Technology patent application US 9,085,897 attributed to Brendan Mark Quine in Cookstown, CA but assigned to Thoth Technology in Pembroke, ON. Quine, an assistant professor at York University in Toronto, ON is also listed as the chief technology officer of Thoth Technology on the Thoth Technology website. Graphic c/o US Patent and Trademark Office. Of course, the patent isn't a space elevator, at least in the sense the words have been used before. The patent is more appropriately a "balloon tower," a 20 mile high structure too small to be a "space elevator" but certainly useful enough for proof-of-concept studies and as a jumping off point for larger structures. And that's also assuming that the system will work. A key component of the patent, the gas expected to be used by the inflatable tower, wasn't defined in the patent. If you use helium, leakage will make it very expensive. If you use hydrogen, flammability in a structure that is likely to attract lightning is an issue. Other light gasses, like methane, also have flammability problems. The only gas that is safe and low leakage is neon, and that is also very expensive. Which is likely one of the reasons why entrepreneurs haven't yet jumped aboard to take advantage of the proposal. There's also a second reason; inflatable towers aren't really a new thing. There are already inflatable radio towers and the cell structure the patent describes is already used in large inflatable structures and blimps, at least according to several of the comments in the August 15th, 2015 Reddit Space post, "Company in Canada gets US patent for space elevator." Thoth Technology graphic promoting the 20 mile tower. Graphic c/o Thoth. As observed at the beginning of this article, this specific idea is not even new to Thoth. As outlined in the July 25th, 2009 CTV article, "Canadian couple shoots for stars with space elevator," Thoth Technologies has run a very similar plan up the promotional flagpole at least once before, with publicly disappointing results. But the patent could also be a blocking or pre-emptive patent registered in order to allow Thoth to keep competitors out of a particular market or technology field. Pre-emptive patents also allow for access to licencing profits, a system where the company able to role out the product covered by the patent, is required to share the profits with the company which was first issued the patent. That would, of course, generate some revenue for Thoth and this would certainly be a change, given its history of developing interesting concepts which never get funded. An example would be the December 8th, 2014 post, "Engineering Expertise, Marketing Knowledge & Business Acumen Each Needed for "Beaver" Crowd Funding." The post discussed a Thoth generated Indogogo crowd funding campaign under the title "Northern Light Mission to Mars," which managed to raise only $10,012 CDN, or only 1% of the $1.1Mln CDN the company said it needed in order to move forward. Will this fiscal inertia change over the next little while? Stay tuned. Bomarc missile cancellation. April 1960. On February 16th 1960 Arnold Frutkin, Director of International Programs at NASA announced that his agency would like to purchase Skylark rockets from Britain, to be launched in Australia and tracked by mini-tracking stations in the UK and Canada. This positive gesture from NASA to cooperate on a new project with the main Commonwealth countries came in just a few days before the United States' Congress made a fateful decision. Less than a year after selling BOMARC-B to Pearkes the United States' government officially started to scale back its commitment to the missile. The standard BOMARC had been equipped with a liquid-fuel engine which on the BOMARC-B had been replaced with an untested solid fuel system. No less than seven BOMARC-B missiles had exploded on the launch pad in Florida. Even without these problems the troubled system was essentially useless to Canada as it did not have the accuracy or range to strike an enemy aircraft. Instead it was intended to carry a nuclear warhead that would detonate somewhere in close proximity to any invading Soviet intruder. The critical downside to this strategy was that in the locations where it was deployed it would be dropping radioactive fallout near to populated parts of Canada. Prime Minister Diefenbaker and his cabinet could not decide whether to arm the missiles, in part because of this and in part because they didn't want Canada to seem to be contributing to the proliferation of nuclear weapons. Diefenbaker insisted that NORAD should operate under the confines and regulations of NATO. He thought this would be the easiest way to maintain a level of control for the Canadian government which would otherwise be reduced to "satellite" status, in permanent thrall to Washington. In April 1958 Diefenbaker claims that the Defence Research Board had told him that the BOMARC had a longer range and a "kill potential in terms of cost that was likely to be ten times greater than that of the CF-105." He then later stated in his memoir that the BOMARC was ineffective against ICBMs but that he was given "no information that the United States would abandon, or had abandoned, its plans to manufacture a conventional warhead for this missile...It behooved us not to panic on the first evidence that we had acted on poor technological advice." Last Week: "Replacing the Squadrons: the Arrow: its Cancellation and the Reasons Behind the Decision," in part five of "The Empire Strikes Out - Canada's Defence & The Commonwealth Space Program." 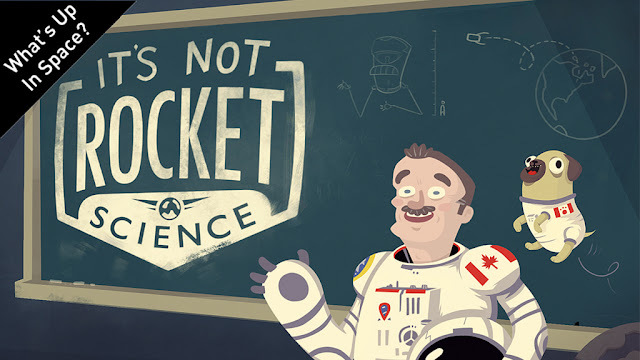 Next Week: "Canada Rejects the Commonwealth Space Program," as part seven of "The Empire Strikes Out - Canada's Defence & The Commonwealth Space Program" continues! NanoRacks LLC and Made In Space Inc have announced a new joint venture that will enable on-demand manufacturing of cube-sats on board the International Space Station (ISS) for deployment in low-Earth orbit. The NanoRacks cube-sat deployer (NRCSD), installed on board the ISS in 2014, is one of two cube-sat launchers on board the ISS (the Japanese experiment module small satellite orbital deployer (J-SSOD) is the second). Photo c/o NASA. The new initiative represents a paradigm shift in satellite manufacturing and also highlights the NewSpace industry's knack for reaching out to non-traditional groups and getting them involved in space---in contrast to traditional space advocacy groups. As outlined in the August 11th, 2015 Made in Space press release, "Made in Space and NanoRacks take first steps towards on-orbit satellite manufacturing assembly and deployment," the venture, called "stash & deploy" entails storing an inventory of commercial-off-the-shelf (COTS) and custom satellite components as well as a microgravity 3D printer on board the ISS which, working together, will enable rapid assembly and deployment of cube-sats in space. The program leverages NanoRacks' existing ISS facilities and expertise in cube-sat development as well as Made In Space's micro-gravity 3D printing technology. In-orbit building and deployment of satellites would have significant advantages over launching them from Earth. Satellites could be built and deployed in a fraction of the time needed by traditional methods. In addition, with satellites no longer being subjected to the stresses of being launched via rocket, they could be built with less expensive materials and have their structures optimized for a micro-gravity environment. 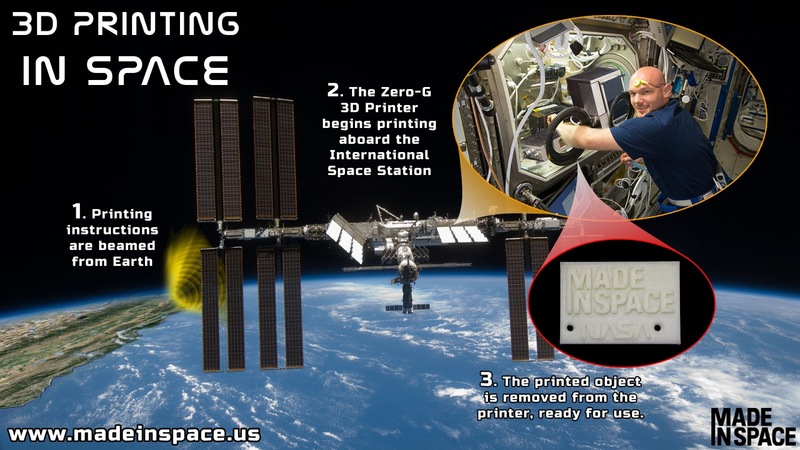 Made In Space has also made clear that its ultimate goal is scaling up their microgravity 3D printer to enable orbital printing of larger structures, such as spacecraft and space stations. 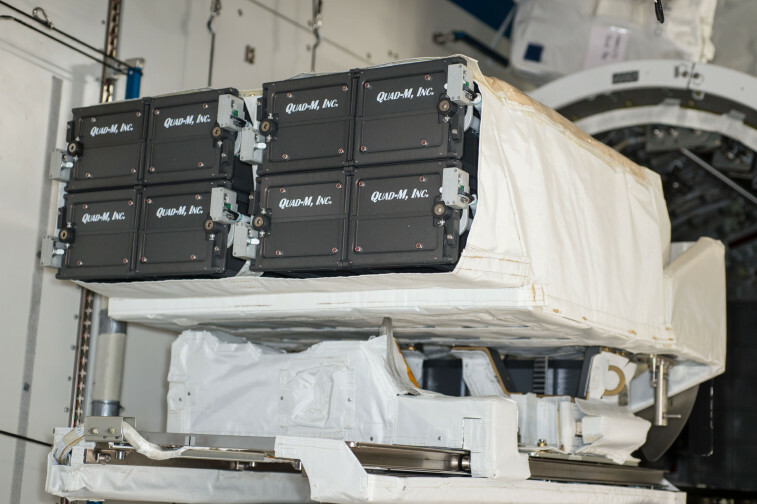 NanoRacks and Made In Space say the "stash & deploy" service will be available in Q1 of 2016. Made in Space info-graphic outlining the first 3D printing of an object on board the ISS in November 2014. As outlined in the November 25th, 2014 3D Printing article, "First Ever Functioning 3D Printed Object Has Been Fabricated in Space by NASA & Made In Space," several private companies are now working on methods, applications, and technologies to enable 3D printing outside of the earth’s atmosphere. Graphic c/o Made in Space. Parallels can be drawn between orbital assembly of satellites and the personal computer revolution of the late 1970's and early 1980's. Like computers, satellites have evolved from large, proprietary and expensive systems available only to governments and corporations into low-cost, standardized and commoditized hardware. With the advent of the personal computer, computing went from being a black art practiced by an elite, to a field that attracted new players who innovated and advocated. Space advocacy groups are often accused of eternally 'preaching to the choir'---of refusing to court members of society outside of their traditional clique (i.e. scientists and engineers). This parochialism has in turn prevented the space advocacy movement from gaining influence over government decision-making or even society at large. By democratizing satellites, the "stash & deploy" service may well draw interest from hitherto ignored players who will spur a new wave of space innovation and inspiration. 3D printing also has other uses. 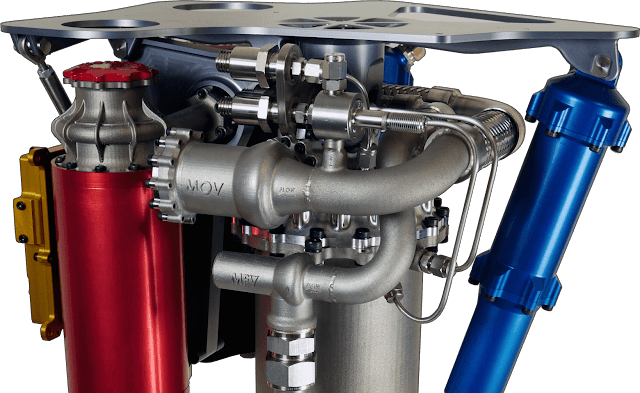 This electric Rutherford engine is the first oxygen/hydrocarbon engine to use 3D printing for all of its primary components including the engine chamber, pumps, main propellant valves and injector. 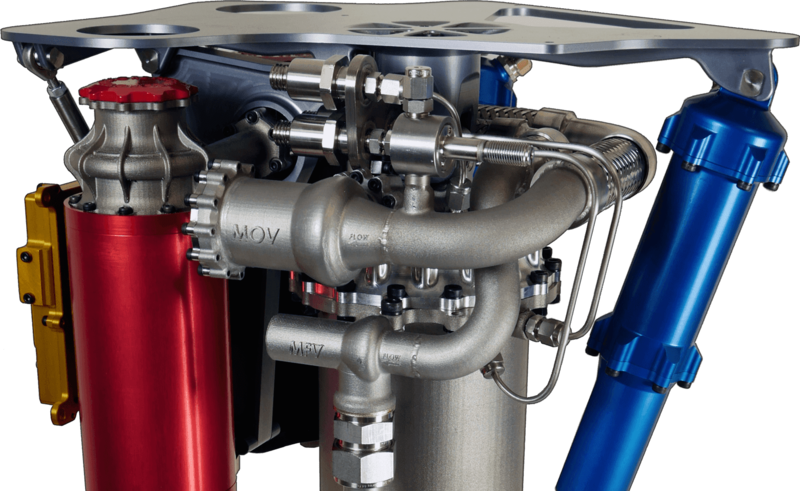 As outlined in the April 14th, 2015 3D Print.com article, "Built Almost Entirely of 3D Printed Parts, the World’s First Battery-Powered Rocket is Unveiled," the Rutherford engine, financed by several high-tech investors including Lockheed Martin, is expected to begin launching satellites in 2016. Graphic c/o Rocket Lab. While the human spaceflight subset of the space advocacy community continues to leap mindlessly at every shiny new space thing - with little success, the robotic subset of the space faithful are quietly flying an increasing number of small satellites - in outer space. In so doing they are slowly building a ever-broadening cadre of people - a group that often includes people from outside the band of usual suspects you'd expect to be doing space stuff. These are the sorts of people that space advocates routinely ignore. As a result of these smallsat projects an increasing diverse number of people can now say "yes, I flew something in space". In many ways space advocates block more access to space than they facilitate due to the stereotypes that they perpetuate and the population sectors they ignore. If space advocates want to spark a space revolution then they need to forget about all the space evangelism crap and just put actual space access into the hands of everyday citizens. Once people get interested - if they get interested, that is - they'll know what to do when they want more of it. By the way: if NASA expects to be able to generate and then maintain the multi-decade political and financial juggernaut needed for their #JourneyToMars they ought to be paying very close attention to the limitations of space advocates and the vast untapped potential resident within everyone else. If this harnessing of untapped potential does come to pass, then the merging of satellites and 3D printing will have (in more ways than one) been a match made in heaven. 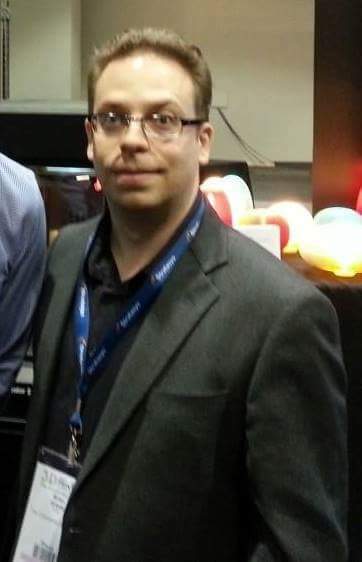 Brian Orlotti is a network operations centre analyst at Shomi, a Canadian provider of on-demand internet streaming media and a regular contributor to the Commercial Space blog. If articles such as the August 13th, 2015 Canadian Manufacturing post "BC’s aerospace industry reaching new heights" are any indication, the recent plethora of Federal government grants for aerospace research and development have been joined by the growing awareness of the need for appropriate marketing expertise in order to promote Canadian innovation on the world stage. Are you frustrated trying to reach government buyers amidst declining defense budgets and fewer trade shows? Fortunately, your marketing is about to improve. 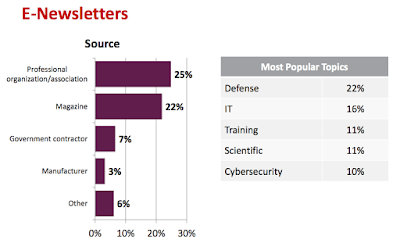 To begin with, you need to check out the 6th Annual Federal Media & Marketing Study™. This 2014 report analyzes the media usage of 3,700 federal decision makers, as well as their demographics, job function and purchasing habits. 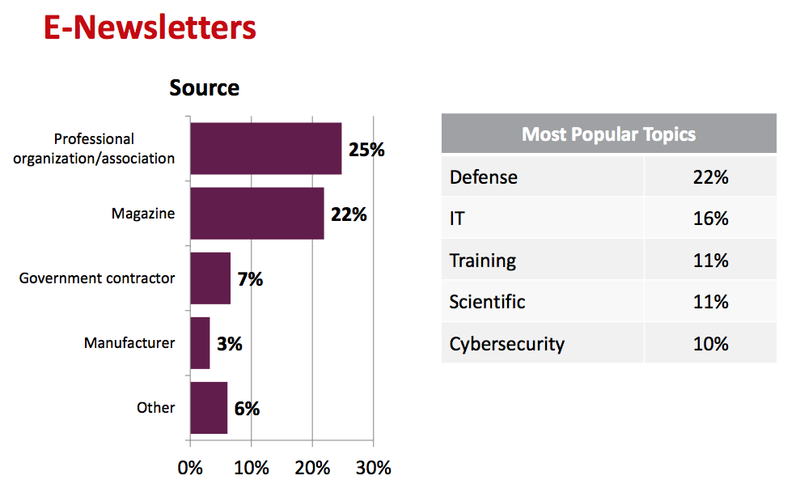 Just over one half of the respondents are in a defense or military related government agency. Not surprisingly, the study’s dominant thread is declining budgets. 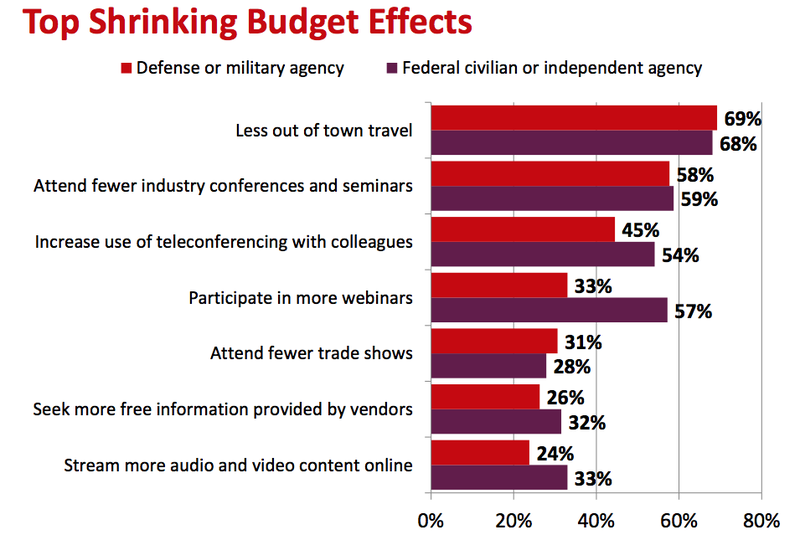 The impact of budget cuts on the federal decision makers manifests itself in less out-of-town travel to attend industry conferences, trade shows and seminars. 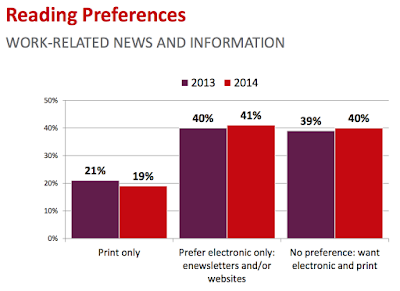 Conversely, there is increased preference for and use of electronic media such as blogs, e-newsletters and webinars. 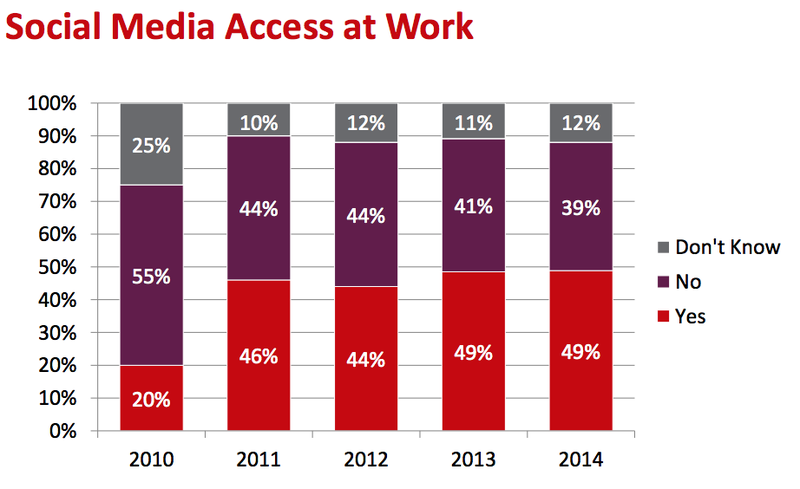 All graphics c/o 6th Annual Federal Media & Marketing Study™. The study focuses on the changing media habits of federal decision makers that, while worrisome to defense contractors who continue to market themselves with increasingly ineffective traditional methods, are an opportunity to any company that embraces the new rules of marketing and public relations. Nature abhors a vacuum. 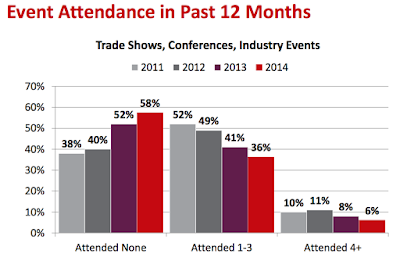 If a growing number are attending fewer trade shows, conferences and industry events they are still going to want to get information to make informed acquisition decisions. This represents an opportunity for defense contractors to fill that event void with content marketing. Examples include company blogs, social media, webinars and e-newsletters. 2. Electronic Media Is Overwhelmingly Preferred Over Print. While there is and always will be a place for printed material, if the majority of your content is printed versus electronic, you’re not providing information in a format that most prefer. Moreover, electronic reading material can be updated frequently and in real time. What’s more, with electronic media your content can be found by prospective buyers you don’t know. 3. 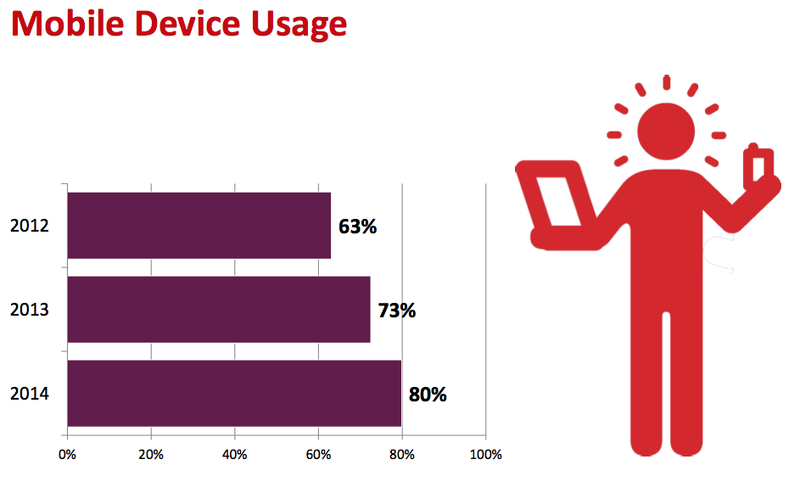 Mobile Device Usage Continues To Grow. 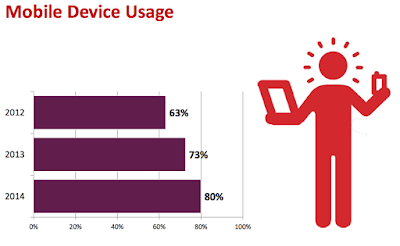 Did you know that more Internet searches are now done on mobile devices than desktop computers? 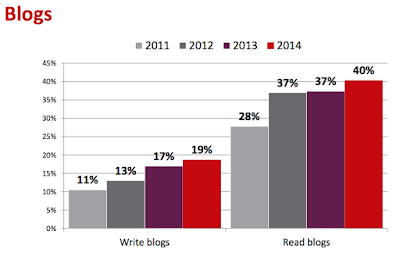 If your website and email newsletter are not mobile optimized, your content is effectively reach a shrinking audience. However, if your content is optimized for mobile devices, your company will reach more people and send a message of being technically competent. Not long ago (circa 2010) most of the federal decision makers did not have social media at work. If you’ve held off on using social media to help spread your content and interact with your different audiences, you’re ceding ground to your competition. What’s more, people without social media at work are on it at home or on their mobile devices when on the go. Blogs are simply articles posted to a section of your website (in reverse chronological order) that include the ability for readers to make comments and use social media to share the content. You’re reading a blog right now. But one of the biggest mistakes companies make with their blogs is to publish information exclusively about themselves. If you want a successful blog that generates a lot of website traffic and leads, publish information that is helpful to your prospective customers. For example, John Deere blogs about how to be a successful farmer in the Machinefinder blog while the American Express OPEN Forum focuses on how to run a small business. The most important thing you should be trying to do with your Internet marketing is capturing email addresses of prospective customers so that you can continue to keep in touch with them with e-newsletters and nurture them toward a sale or other desired action. But like any successful blog, your newsletter needs to have content that is interesting to and helpful for your prospective customers. Taken together, these six points provide an overview of an industry struggling to adapt to changing situations and circumstances. Fortunately, those industry upheavals also provide ample, low cost opportunities for entrepreneurs willing to embrace the changes and take advantage of where the market is moving. 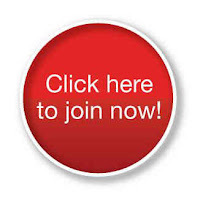 Will you be one of those entrepreneurs? To download a free overview of the Federal Media & Marketing Study™, click here. Douglas Burdett is the writer/ editor of the Fire Support blog, an arsenal of marketing tips, tactics, trends and tools for aerospace and defense firms looking to increase sales. Burdett is also the principal/owner of Artillery Marketing Communications, which helps B2B companies increase leads, grow their businesses and build their brands. This article was originally published in the Fire Support blog. 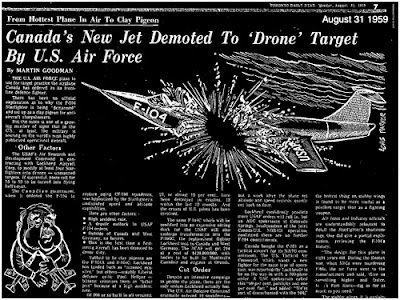 Announcement that Lockheed F-104G converted to drone for target practice (August 1959). Two weeks after Canada geared up its aerospace industry to produce the F-104G the USAF announced that they would forthwith be automating their own F-104s to be used as drones for target practice. 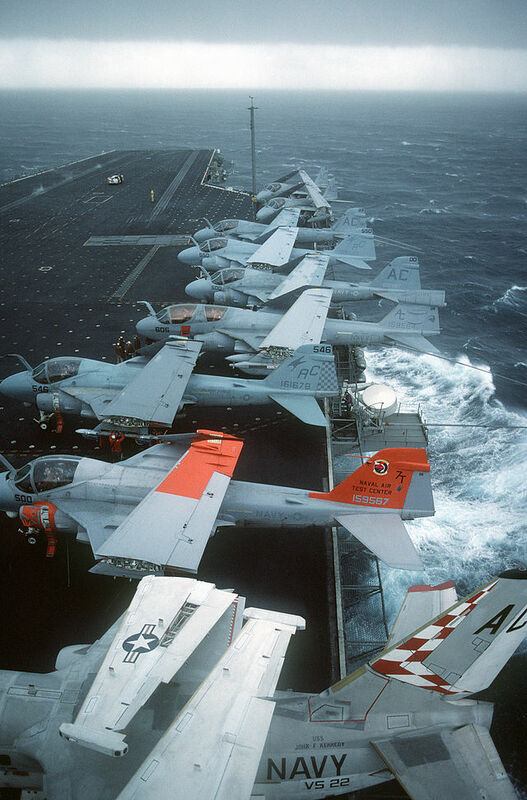 No aircraft had ever been relegated to such a fate before. Meanwhile, the Hawker 1127, which could have been built at Avro is still the world's only successful vertical take-off fighter, and would instead be built under license in the USA. After being continuously upgraded it is expected to remain in active service with the US Marine Corps until 2025, making it the most successful fighter in history. The design has not become obsolete, after almost 60 years, even though it is not a supersonic aircraft. It couldn't have effectively defended Canada but it would have made up for that shortcoming with the balance of trade it would have generated, while simultaneously keeping Canada's team of experts employed. The fact that Avro was already doing advanced vertical take-off work for the US Army made it an even more logical choice. But with the government's decision to select the F-104G, what little hope that may have remained at Avro was now dashed. Canada still had to deal with the "new" paradigm, defending against Soviet bombers, which, despite a stream of predictions to the contrary, hadn't all disappeared. By late December discussions were underway to purchase McDonnell-Douglas Voodoo aircraft from the United States to reequip the domestic squadrons. USAF General Kuter during a visit to Ottawa said "There will always be need for a manned fighter," somewhat belatedly agreeing with Canada's Chief of Air Staff. The Voodoo was apparently capable of intercepting Soviet bombers since it could carry nuclear missiles and had a speed of 1100mph and a range of 1500 miles. None of its specifications matched those of the Arrow which had more range, was faster and could carry more armaments. However, the Voodoo was cheaper. Last Week: "Britain follows Canada's Lead; Rearming the RCAF and the Commonwealth Space Symposium," in part four of "The Empire Strikes Out - Canada's Defence & The Commonwealth Space Program." 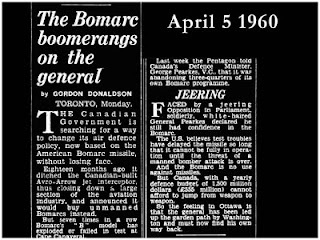 Next Week: "BOMARC; the Blue Streak; the Blue Steel; or the Douglas Skybolt and Woomera," as part six of "The Empire Strikes Out - Canada's Defence & The Commonwealth Space Program" continues! Two recent announcements highlight the growing Canadian demand for global positioning and Earth imaging technology. Connected by a constellation of satellites and rescue assets, today's modern, highly accurate GPS-equipped Emergency Position Indicating Radio Beacons (EPIRBs) and personal locator beacons (PLB), which were developed as part of the International Cospas-Sarsat programme, could be your lifesaver in an emergency. 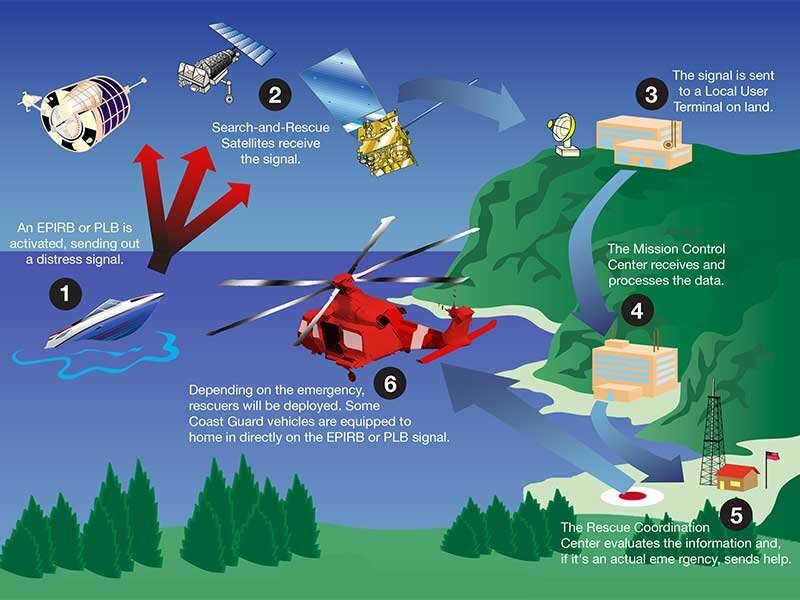 MEOSAR will integrate into this system using a series of search and rescue (SAR) transponders aboard Europe's Galileo satellite navigation system, the Russian Glonass space based navigation system and the US Global Positioning System (GPS) satellite constellation to report signals through Cospas-Sarsat search and rescue beacons in the 406.0–406.1 MHz band. Graphic c/o Boat.U.S. As outlined in the August 3rd, 2015 Space News article, "Canada Finds its Way To Providing GPS 3 Search and Rescue Repeaters," funding has finally been approved for a resumption of a project to provide repeaters for the Medium Earth Orbit Search and Rescue (MEOSAR) satellite system. According to the Department of National Defence (DND) website on the MEOSAR program, the project "will deliver a space segment, comprising up to 24 Search and Rescue (SAR) repeaters that will piggy-back on the satellites of the United States Air Force's (USAF) next-generation GPS III constellation," along with "a ground segment comprising satellite ground stations in Canada with specialized satellite tracking software and information processing systems." Unfortunately, right after the initial announcement, further funding for the program was put on hold. One of the reasons for the delay might just have been the give and take between the DND and other Canadian government departments over who would fund the repeaters. PSC seems to be the go-to website for issues the Federal government would like to address outside of traditional channels. The department has a broad mandate encompassing a wide variety of matters. Graphic c/o PSC website. Public Safety Canada (PSC) eventually stepped up to the plate. As outlined in the July 24th, 2015 Federal government press release, "Government of Canada announces improvements to Canada's Search and Rescue system," PSC will be taking over investment in the MEOSAR program, and will provide "up to $249 million (in additional funding), as identified in the 2015 Defence Acquisition Guide." But more importantly, the program will be transferred from DND to PSC, since PSC is supposedly covering the cost. MEOSAR, is an add-on to the International Cospas-Sarsat programme of satellite-based search and rescue (SAR) system established by Canada, France, the United States and the former Soviet Union in 1979. The Secretariat of the International Cospas-Sarsat Programme is based in Montréal, PQ. TerraSAR-X and TanDEM-X. The satellites use phased array synthetic aperture radars (SAR) operating in the X-band (31 mm, frequency 9.6 GHz) to acquire high-quality images of the Earth for environmental planning, land use and natural resource exploration, disaster relief, insurance and defence applications. They operate together, using a HELIX satellite formation, in a close polar orbit at 514 km altitude. Graphic c/o Airbus. But MEOSAR isn't the only program moving forward. As outlined in the August 5th, 2015 Airbus press release "Free Provision of TerraSAR-X and TanDEM-X Data for Government Studies and Professional Training in Canada," Airbus Defence and Space has signed an agreement with the Canada Centre for Mapping and Earth Observation (CCMEO) in order to provide Canadian governmental and institutional data users free access to TerraSAR-X and TerraSAR-X add-on for Digital Elevation Measurement (TanDEM-X) satellite imagery for "pre-operational use." 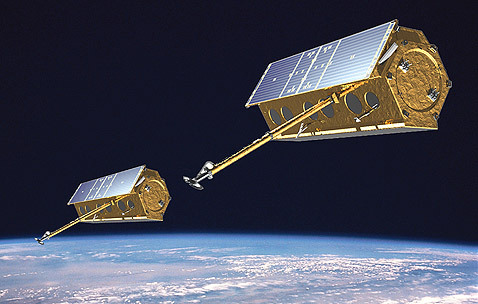 The main goal of the agreement, according to the press release, is to "support current efforts of Canadian agencies working on the development of operational monitoring concepts that exploit the benefits," of paring the data collected by Canada's existing C-band SAR (utilized by the various RADARSAT missions) and the German X-band SAR utilized by TerraSAR-X and TanDEM-X for maritime surveillance, disaster management and environmental monitoring. Given that the CCMEO mandate is to provide access to satellite image data and products to both government and public users, it seem reasonable to believe that some of this new data will eventually begin filtering out into the private sector. Then the real development can begin.